The Council has just completed its â€œJourney Beyond disability â€“ Success Stories of a Disability Icon and Achievers â€œâ€™ publication. It aims to launch the countryâ€™s evidence-sharing in line with the UN-Convention on the Rights of Persons with Disabilitiesâ€™â€™ (CRPD). In particular, it top bills work excellence of 42 Filipino men and women with disabilities for starters, whose success stories have indelibly marked our countryâ€™s history and development. This segment kicks off with a feature on our national icon, the â€Sublime Paralyticâ€ and â€œâ€Brains of the Revolutionâ€ Apolinario M. Mabini. 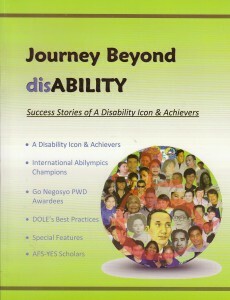 The Magazine comes in six segments: 1) posthumous recognition of outstanding disability icon and achievers; 2) International Abilympics (Olympics of Work Skills of Persons with Disabilities) Champions; 3) GO-NEGOSYO PWD Awardees; 4) DOLEâ€™s Best Practices of 3 Self-help Groups of PWDs from Luzon, Visayas and Mindanao 5) Special Features ; and 6) AFS-YES Scholars. Work excellence as its theme, this project is in collaboration with the Department of Labor and Employment, led by former Secretary Marianito D. Roque, and envisions to trigger a continuous recording of success stories and best practices in various disability fields. paano po ba magkakaroon ng ganitong babasahin? @meliton artemio, dito po sa rosales, pangasinan newly organized po ang aming samahan. puede po ba kaming makakuha ng copy ng ating latest publication? akoy nanainiwala na malaking tulong ito sa amin.